Everyone recognizes what a material crack is. However, we distinguish between cracks and crazing, since they have a different appearance and somewhat different causes. A crack is defined as a single separation of a surface; whereas, a crazed surface has many micro-cracks spreading randomly like a spider web. There can be multiple cracks in a surface. Cracks are easily visible. Crazing may not be visible without magnification. Causes for cracks are normally either an impact from an object or excessive stress from a constant load. They can also occur from fatigue caused by stress cycles (e.g. thermal expansion/contraction) Since the strength of a material declines as temperature increases, cracks occur more readily when the material is hot. 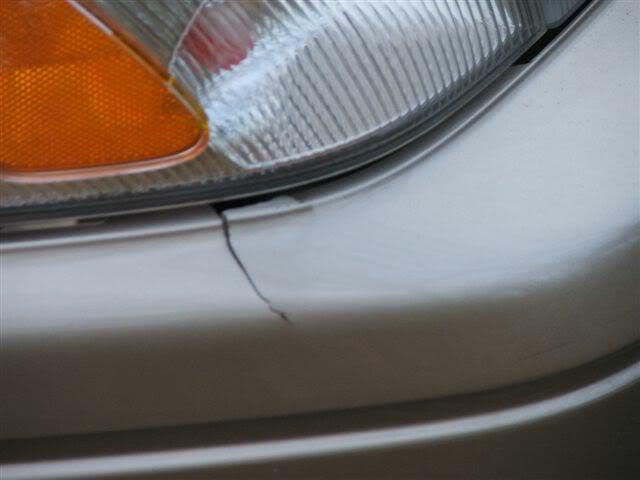 The photo below shows a crack in a plastic automobile bumper. Cracks occur in spas, bathtubs, showers, sinks, and countertops regardless of the type of material.